I have a thing about red and black at the moment. Taken over my obsession with black and pink and now all I want is red everything! Must have some psychological meaning behind it or something! Pretty terrible quality images, but it was actually so dark when I took them I had to over expose them, which obviously has made 'em a bit odd! Oh well! 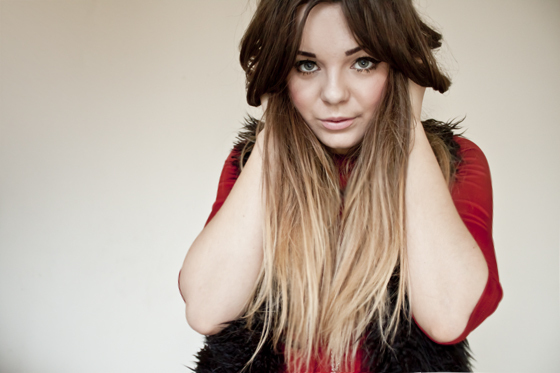 This is the fur gilet I've been mentioning alot recently, Cant remember if I've actually worn it on here or not though! I'm tempted to order a few things from Forever 21 online, but I've not ordered with them before, if anyone has lemme know in the comments! Im really curious about their delivery times/returns! Went shopping with my lil' stepsisters today to get my Dad his birthday present (some boots from Clarks, which cost £70, reduced to £34!) then I popped into Topshop and found this coat which I've wanted for ages. I nearly bought it full price during the summer, but when I saw it in my size and reduced to a mere £15, I knew it was meant to be! Had a mega fatty KFC and then we had a sly trip to pets at home to coo over chinchillas and bunnies! Ahh I love that dress. That dress is really pretty :) I love your necklace aswell, I've got a thing about crosses at the moment! I love the dress and the fur gilete! I love the red and black together, really stands out :)! I love this dress ! Black and red is one of my favorite color mix ! Your so beautiful! And no way are those crappy pictures! Your like a style icon seriously. Love your blog so much! Loving the red and black Lily, still kinda festive! I think chinchillas are one of my favourite animals, they're like oversized mice with fur like velvet... amazing! You look beautiful in red and black! Love your nails as always! I love this dress, it's the most flattering shape and I love red, especially at this time of year! Just got a fur gilet myself and I'm in love, they look so good with everything! i ADORE that gilet, i need it in my life!! That colour looks gorgeous on you too. Aother outfit I really like, I am not the biggest fan of fur but this one looks nice, although I need to say that I would wear with something like e sweater from the last post, in black, and this would be awesome. Is really nice. What are you planing to do on new year's eve? The second picture is really striking Lily! Lovely outfit! I really like the furry gilet it looks so cosy :) I always go to pets at home but then feel like I need to buy all of the animals haha, chinchillas are the cutest! i've ordered from f21 before and they were really reliable :) never sent anything back though, but i reckon it would be pretty easy! Love the fur, always looks so good on you too. Love the outfit, the fur is lovely! The coat is lovely as well, bargain at only £15! Live the outfit. The colour combination works really well. red colour suits on you by the way awesome dress.